Chennai Super Kings go top of the table after another efficient performance by their bowlers on a slow pitch. He still needs to learn the art of bowling yorkers. Some extra pace will help as well. The Chepauk pitch, however, is perfectly suited to his style of bowling. Chahar makes the ball skid off the deck. He has also become pretty good at taking pace off the ball. 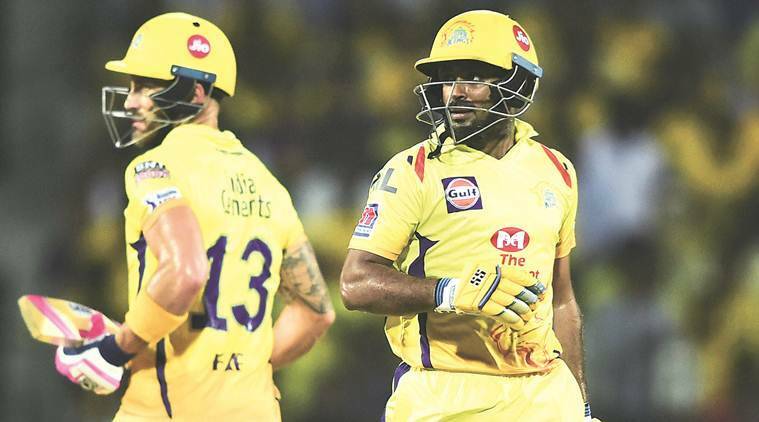 Chahar’s first wicket came in the very first over of the match, after MS Dhoni won the toss and promptly elected to field at a dewy Chepauk on Tuesday. Chris Lynn had been attempting cross-batted swats against Chahar, but the ball wasn’t arriving. The final delivery of the first over landed on the seam and caught the Kolkata Knight Riders opener plumb in front. Lynn was early into his shot. Chahar’s second wicket came in his next over, when Nitish Rana mistimed a skidder and was caught at mid-wicket by Ambati Rayudu. The CSK seamer then removed Robin Uthappa with a short ball that was bowled at around 120kph. Uthappa had hit consecutive fours in the first two balls of the over, but Chahar came back well. The highlight of the Powerplay, though, was the way Harbhajan Singh teased and dismissed Sunil Narine. But we would come to that later. As for Chahar, the most impressive part of his bowling today was the way he out-thought Andre Russell a couple of times at the death. The Knight Riders hitman was playing a lone ranger. 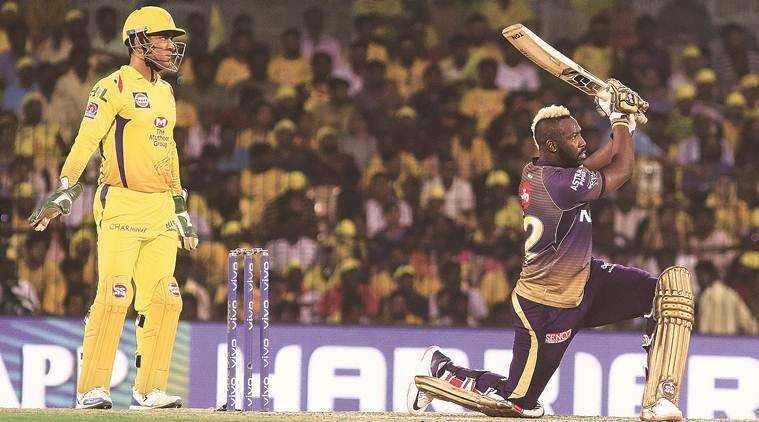 His team was yet to reach three figures when the penultimate over started and Russell had to make the most of the final 12 deliveries of the innings. A charge was due, notwithstanding the fact that KKR had lost nine wickets by then. Russell stood deep inside the crease expecting yorkers. Chahar bowled a slower bouncer outside the off stump instead. The batsman was beaten. Another slower bouncer followed, and Russell yet again missed it. Chahar didn’t give the batsman any pace to work with. He returned with 3/20, taking his tally to eight wickets from six matches at an economy rate of less six runs per over. Rayudu put on 36 runs with du Plessis. Rajasthan Royals tried the trick in the last match – an off-spinner upfront against Narine on a sluggish pitch. At Sawai Mansingh Stadium two days ago, the KKR opener had decimated K Gowtham. At Chepauk today, Harbhajan schooled Narine. Given his pedigree and the purple patch that he is going through, Harbhajan’s dominance over a pinch-hitting opener was expected. On a slow, turning pitch, the veteran off-spinner slowed it up. He teased Narine by varying his length. The ball that accounted for the latter was bowled at 79kph. Narine was undone by the loop and attempted a wild slog. Chahar took the top-edge at backward point, running back and diving to his left. Imran Tahir came into the attack in the ninth over and removed Dinesh Karthik, who was batting sensibly. In his next over, the leg-spinner dismissed Shubman Gill with a googly, as Dhoni effected a smart stumping. Together Harbhajan, Tahir and Ravindra Jadeja shared five wickets between them, giving away 53 runs in 12 overs. KKR laboured to 108/9 in 20 overs because Russell capitalised on a reprieve and scored 50 not out off 44 balls. Harbhajan dropped him off Tahir when Russell was on eight. KKR might not have reached a hundred if the catch were taken. The visitors, too, had the likes of Kuldeep Yadav and Narine in their ranks. But they had to deal with the dew factor. Also, quality-wise, CSK batting was a notch higher, which proved to be the difference in tough conditions. 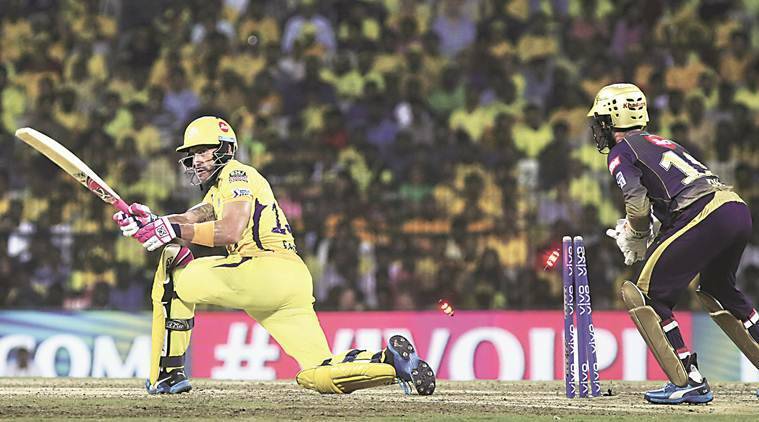 Faf du Plessis anchored the chase in Super Kings’ seven-wicket win, with 16 balls to spare.